A merger is a long way off – even if one is announced it’s going to be a while before the credit cards and miles are consolidated. I wouldn’t really bank on a merger, but if it does happen, inevitably your miles will merge as well. I’d be sad to see my American and US Airways miles combine into one because it would inevitably give me less redemption options since the combined airline would only be a part of one airline alliance. However, some people may make out very well since they will combine your US and AA miles, so if you have small balances in both, you may finally have enough collective miles to book a trip. Plus, it’s very likely that lifetime flight miles on both US and American will count towards lifetime elite status. 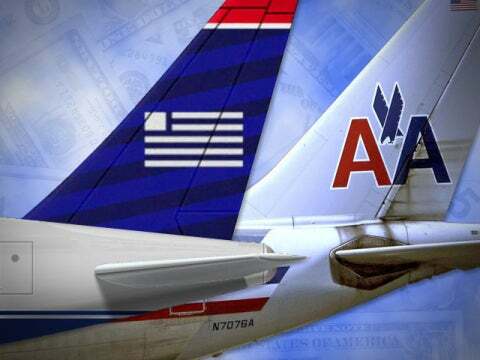 However, when applying for credit cards, both AA and US Airways miles are valuable for different reasons. I love using my AA miles for first class awards on Cathay Pacific and frequently there are low fees on one-way awards. US Airways is part of Star Alliance so there a lot of different redemption partners and pretty flexible routing rules. Both AA and US Airways offer off-peak awards so you can sometimes score great deals depending on your timing and destination. The 50,000 point bonuses for the Citi AAdavantage Visa and Amex cards are still available as far as I know. Although its not an official deal, if you read through the comments on this FlyerTalk thread it appears people are still getting in on it. As far as a US Airways credit card, Barclays is currently offering a 60,000-point bonus – 40,000 miles for first use, up to 10,000 miles for a balance transfer within 90 days, and 10,000 points for each subsequent account anniversary. If you have a lot of Chase and Amex cards and want to cycle in a new product this may be a good idea. You get 5,000 miles off US airways redemptions and a bunch of other perks like double miles on every US Airways purchase and 1 mile per dollar spent on all other purchases. If a merger does happen there are still a lot of open questions about what will happen to the mileage program. I hope that the program would remain AAdvantage and that the airline would stay within the One World Alliance. If you’re thinking that all your AA miles will become Star Alliance miles, I wouldn’t bank on that. With that being said there’s still a lot up in the air (so to speak) and anything can happen so stay tuned for further developments.